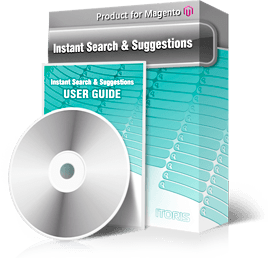 The fastest search module with partial match support for Magento! See speed tests below. No additional software like Sphinx or Solr needed! Why is it sooo fast? We have found a way to utilize the low-level search capabilities of the Linux file system. It works much faster than any database server, MySQL, Sphinx, or SOLR used by Magento Enterprise. Typically the database creates an index which is a regular file on the file system. Our module creates and accesses the index file directly bypassing the database server. This performance boost achieved by using the "grep" Linux command called through the command line in the php script. The Instant Search module provides immediate search results while you are still typing your search phrase! It outputs results instantly even on a large database of 200,000 products/SKUs or more in Magento! You can enable search for products, categories, and CMS pages. Choose which elements you want to display: product name, image, rating, description, price, add to cart, wishlist, compare links. Plenty of settings will allow you to customize the results list. Change size of the pull down block, size of product images, length of description. Set the list length. You can set the default sorting by rating, popularity, creation date, alphabetically, relevancy, and relevancy with exact match. Excellent algorithm of sorting by relevancy will put the most closest to your search phrase results on top. So your customers will find exactly what they are looking for. Instant Search's relevancy has the following priority: the exact match of SKU goes first, then exact match in the product name, then partial match in the product name, then exact and partial matches in the description. Also you can add extra attributes to search if needed. For example, if you want to search by brand, additional details, etc. The module supports keyword synonyms. Bind a few keywords and show results for all together. Once the results are shown the keyword is highlighted in all texts. Instant Search can predict the search phrase. For example, if you enter "app" it will suggest "Apple" in the "Google-style" in the same field. Products can have image, title, description, rating, add to cart, add to wishlist, add to compare, price. Full management over products’ display. Decide what to include, limit description’s length, set the order of products’ display (alphabetically, by popularity, by relevancy, and so on). Ability to include or exclude CMS (convenient for special CMS pages like 404, cookies, or temporary ones with proposals). Manage CMS results display - how long the description should be, number of articles, display order. Select categories to be displayed or not. Each category is clickable. Measured on LAMP (Linux + Apache + MySQL + PHP) system. Hardware: Intel Core i5-3470, 4GB RAM, 128G SSD. Search conditions: partial match in product title, short description, long description, sku. Sorted alphabetically. Search results are in seconds.